First of all, college interviews usually aren’t necessary, so don’t panic. Only a handful of highly selective schools require them, and many schools do not have them at all. Many students also pass up on the option of going to “Interview Day” events because they are unsure of what goes on during the interview process and what effect it will have on their application. But even when they’re not required, for many students, college interviews are often a way to bolster an application and are actually a lot less scary than they may seem. What are admission interviews like? For starters, the college interview is a face-to-face discussion or Skype call between an applicant (or future applicant) and an admission representative or alumni. The whole interview usually lasts half an hour and revolves around two things: the college and the student—so no surprises here. 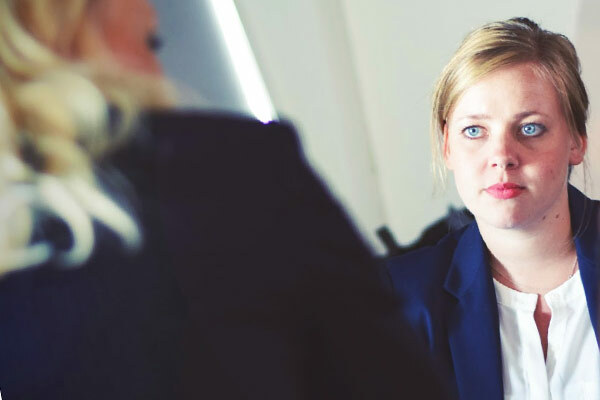 The unique thing about interviews is that they go beyond the written application where students can only respond to those particular questions asked, which may not even provide the ability to go as in-depth as the student wishes. Interviews give the admission team a chance to get to know you better and in more detail. For example, a school’s application may not have a place to explain an unusual drop in grades, but this can be brought up in the interview. In fact, the ability to explain something important that happened to you—a sickness, death in the family, parent’s loss of a job, and how you bounced back from some other adversity—can actually help give really helpful insight into who you are as an applicant (and maybe even boost your admission chances). Colleges love to see character, which only comes through having a variety of experiences. Interviews also show you’re really excited about attending the school, and admission counselors keep track and consider that in making decisions sometimes. Aside from getting to know you better as an individual, your potential future at the college is the other major topic of conversation. While the campus and programs at a certain college may be great, if the school isn’t the right “fit” for you (and vice versa), then enrolling there may not end well. This might seem like a downside to a college interview, when you and the representative realize that a particular school is not your best option. But it’s actually a good thing, since you won’t make the mistake of going there for a semester (or longer)! Also, do not be afraid to continue digging deeper. As much as the admission team wants to get to know you, they want you to have all the information you want about the college. There is usually a time for you to ask your questions, and this is the perfect opportunity to ask about things that go beyond statistics and really get to know about what the next four years of your life could hold. Even if you know someone who attends that school who has told you all about the school, its students, academics, campus life, and more, you should still ask questions. If you know a lot about the college, talk about what you know and ask for really specific details. After all, you want to show how interested you are in the school. It was a warm Sunday morning that I was scheduled to interview with the College of Wooster. They had set up an interview day at a location that was much closer to my house than the college itself. After I signed up, I had repeatedly gone over practice questions, picked out an outfit (fairly conservative, but with a little personality), and felt prepared for a Q&A session. When I walked in (a few minutes early, and a little bit nervous), I was greeted by the admission representative and his wife, who was training to be a representative also. Instead of sitting at a desk, we all sat around a table in comfortable chairs. This set the tone for a relaxed conversation about what the college had to offer. Even though I had prepared for an onslaught of questions, I received few. They were all broad and revolved around what I wanted to get out of my college experience. Of course, they got to know me as an individual and as a student—my hobbies, interests, favorite/least favorite classes—but the focus was more about what I wanted to do in college. I want to major in biology, so we discussed their program. I want to take piano lessons, so we went over the options for that. I told them I wanted a small school where the students were focused on their studies but also had outside interests . . . this is where things got interesting. The admission representatives shared with me their experience of going to the college, along with the things they observed every day. I was able to ask all of the questions I had and was able to clear up any misnomers or concerns I had. The questions were easy to answer and easy to ask because it was such a low-stress atmosphere. While some college interviews are very casual and discussion based, students should prepare for more traditional formal interviews and questions: Who are you as a person? Are you a leader? What will you contribute to our school? What is your biggest weakness? You may never be asked these questions, but, at the very least, answering them will help you understand who you are as an individual. Oh, and remember, sit up straight, smile, dress nicely, and no gum! Now that you’ve heard the student’s perspective, check out what it’s like on the admission side! And let us know what your college interview experience was like in the comments.